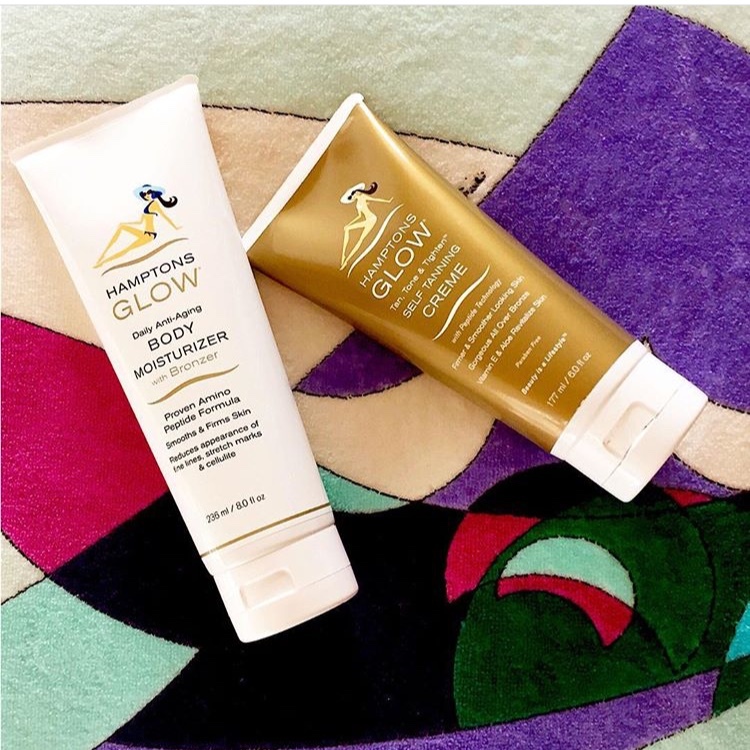 Rachel Thompson is the founder of Hamptons Glow, the go-to self tanning product for Hamptons it girls. We sat down with her and asked her a few questions. What is your background and how did you begin Hamptons Glow? My background is Parsons School of Design, but that was a long time ago. After that, I went into advertising. There, I learned about corporate culture, which was a very important lesson. Then I went into real estate brokerage in 1999, which I did for many years. My design background came into real estate in the use of space, but ultimately I ended up in beauty. I grew up in the South, where you essentially grow up in hair and makeup and tanned everything. So I really felt like I wanted to do something in beauty. I’m very fair, so I used to use self tanners back in the 80s when they were horrible and would dry your skin out. I went into the spray tanning business because I thought that would be an easier way to transition into the business of beauty. I spray tanned for many years, and would spray tan for a lot of designers like Tommy Hilfiger and Tory Burch, but most of my time now is focused on my products. Given what I know from research about anti-aging, I just felt like the products out there weren’t working hard enough, so I created my own. What does your motto “Beauty is a lifestyle” mean to you? It’s all the little things we do everyday that add up to huge dividends when we age. I always wondered when I was younger why some women would age better than others. It was always interesting to me to see the lifestyle choices of women - obviously genetics plays a role - but I really do think that the products we use, sun exposure, nutrition, and exercise all play a huge role in how we age. How would you differentiate your products from other products on the market? In my products I really focus on the multi benefits - everything that I make has multiple anti-aging ingredients, a great scent, and ease of use. If we’re going to be putting something on our bodies, it should be working double time because we shouldn't have to choose between putting on a moisturizer that helps our skin and a self tanner. I always want to kill two birds with one stone and get the maximum effects from one product. My hands on research in the spray tanning field really helped me develop products that women wanted and needed. For example, I created my firming products so that women of all ages can feel beautiful, and show a little skin without feeling self conscious. Also, all of my products are cruelty free. Not one product has been or ever will be tested on animals. That’s something that is very important to me. I’m in dog rescue and I’m such an animal lover, so I refuse to produce something related to animal cruelty. Why do think The Hamptons is an inspiration for yours and so many beauty products? My spray tanning business started in The Hamptons, and I lived out there full time for a few years. I’ve been spending summers there for the past 14 years now, and I’ve learned that the women and men out there want only the best. Their expectations of products are above and beyond anywhere I’ve ever been because women in The Hamptons often are New Yorkers as well, so they tend to want the cutting edge - what’s the best workout? who’s the best nutritionist? what’s the best in organic food? - they also know all the best in skincare and makeup. These women and men are so discriminating that it pushes businesses like myself to excellence because the clients set a very high bar. There’s also many types of beauty in The Hamptons. there’s the beachy girl, the glamour girl, the socialite, the bohemian girl, so it inspires me to think about what will work and makes sense for all of these types of girl. My clients in The Hamptons are always hungry for what’s next, and they know their stuff. There’s no faking it with them because they can identify quality product. I’m so inspired by these women. What is your quintessential Hamptons glow girl? In general, she cares about her appearance, she keeps up her appearance no matter her age - she could be 22 or 65 - “beauty is lifestyle” is definitely on her mind, she works out, she drinks a lot of water and the best juices, she eats healthy, she probably drinks too much wine, she’s got a really good dermatologist, she may be a little bit more bohemian and use only natural products, but she is definitely a big traveler and loves to shop. Health and beauty are at the top of her list. How do you balance work life and personal life as a businesswoman? It’s really hard. You have to force yourself to go out and have fun. When I was really in the thick of starting the business, I felt like my creative juices were not as strong when I was locked inside my apartment researching things, working on branding, etc. It comes down to prioritizing, but you really can have it all. Work should be number one, but you also need to make sure you're dating, seeing friends, and so forth, because sometimes it’s hard to turn off the business part of your brain, but the best ideas come from being out in the world. A lot of my ideas are sparked when I'm out and about. It’s also super important to take time to work out and take care of your body. Overall, you have to continue to reset yourself - to force yourself to re-prioritize and to take short trips here and there to clear out the jumble in your head.